So where are you heading for this Easter hunt? Are you even going on a Easter hunt or not? Stop wondering and take your little ones to some special Easter Hunt or plan your own for that matter. Since, it is the holiday time — Good Friday, Easter and so on, plan a memorable Easter egg hunt for your kids. If nothing’s coming to your mind, what are we for, let me give you some ideas on how you can plan your own outdoor Easter hunt. What should be the first step in order to arrange an Easter egg hunt, of course the venue. If your house garden isn’t that large to hold a huge number of kids, you can book the nearest party venue or park to hold an Easter egg hunt. 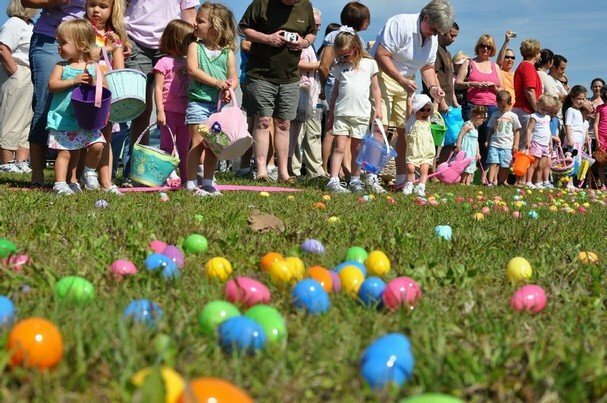 Reach 1 hour early and place the eggs at places which are considerably difficult for kids to seek. What’s inside those eggs always make kids excited. But don’t tell them in advance, keep it as a surprise. Paint these cadburry Easter eggs with your kids’ initials creating a more personalized touch to it and they would be more egg-cited to do that. Why keep it limited to your own kids, ask your kids to invite their friends to join the hunt. The best part which your kids would love is that you planned the whole hunt for them. Moreover, you even have a hidden surprise for them inside. Increasing the number of kids could be exhausting for you but your kids won’t stop thanking you later. You can even have a small Easter party by inviting kids’ parents along. This would even give you a helping hand in executing the whole event. List down or draw a simple list of different types of eggs that you want your kids to find. For instance, you can write the name of the kids and mention it in front of their names — 4 purple eggs, 2 blue eggs, 1 polka dot egg and so on, and whosoever gets them first wins a prize. Easter egg hunt without an Easter bunny is not cool. Your kids would definitely want an Easter bunny and it would add fun to the event. How about father of kids turning into an Easter bunny. It would make your kids feel special and I am sure, you yourself would not want to miss the sight of seeing him dressed as an Easter bunny, but only if he agrees. Ask the Easter Bunny to get a basket along with Easter eggs to turn the Easter egg hunt into a search mission. Fill some of the eggs with clues about where the basket can be found. For example, you have hidden the basket in the shrubs to the east of the garden, then make an arrow explaining the direction and draw the shrubs. See how exciting it becomes to see your kid being a detective. While it is so much fun to see kids hunting eggs, but engaging in what they are doing would add more fun. Be a team lead and choose your team of kids and let other parent who wish to play, gather his own team. Go for it now and help your team search eggs quickly than your opponent. And, if you think, the Easter hunt would finish quickly, you can always add a twist by having a three legged Easter egg hunt by pairing kids with elders. Hide eggs with varying degrees of difficulty that are age-appropriate. So, have fun, enjoy your Easter.